With its on-trend colour combination, and contemporary motifs, this serving platter can be used as both a decorative or functional item. 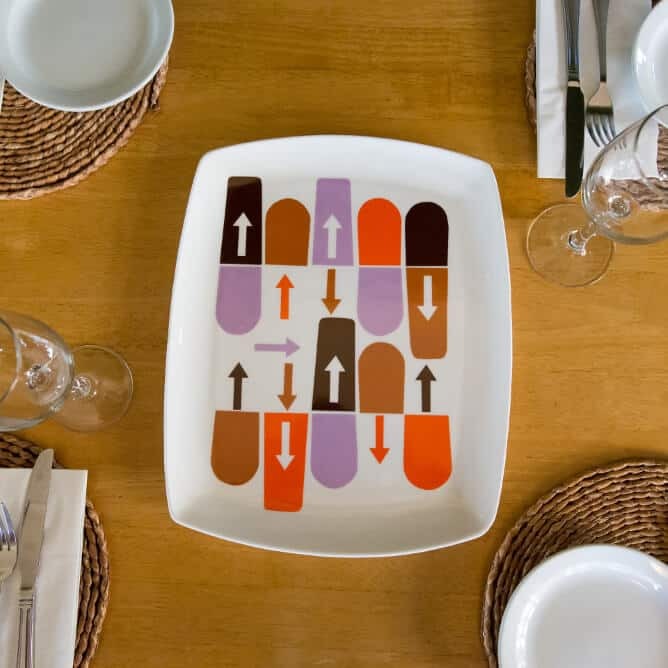 With its on-trend colour combination, and contemporary motifs based on graphics from the everyday, this serving platter can be used as both a decorative or functional item. Laura Lightbody is fascinated by chance. Using graphics that she finds from the everyday, Laura takes inspiration from the often-overlooked items we see all the time; labels, price-tags and envelops. Developing motifs from the found items as well as using off-cuts from the enamels she cuts by hand, allows each of her pieces to be a unique and individual design. By creating slip cast multiples in ceramics and decorating each form by hand, enables Laura to bring together the elements of control and chance…ensuring that you get a true original object.